I'm still channeling that place that makes gelato! 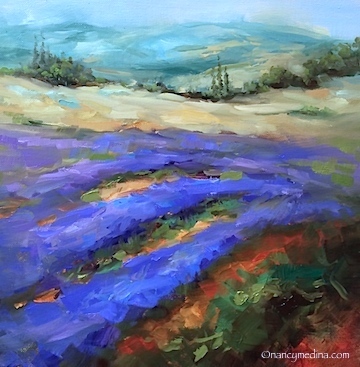 Gone to Seed Lavender Field is the newest daily effort in Flower Mound Studio. I spent a bit more time on this lavender tribute, and really enjoyed putting in the tiny little trees in the background, and the subtle temperature shifts between the pale greens and blues that defined background hillocks and ravines. I kept the foreground bold and chunky, and softened edges in the distance. I moved values closer to one another in the distance, and stretched the distance between juxtaposing values in the foreground to create impact and dynamic color in the focal area. And after all that hard work, I treated myself to a gelato! The perfect way to end a warm summer day in....Texas (did you think I was going to say Italy? ).